What were the themes for your day? Ross and I grew up in Peoria, Illinois, but didn’t meet until we were counselors at Camp Highlands for Boys and Clearwater Camp for Girls, respectively, in Northern Wisconsin. Although I knew his sister (from camp and school in Peoria) and Ross knew my brothers (one was his camp counselor when he was 10), our paths never crossed until that summer. And, ironically enough, our parents now live three blocks apart. We considered Wisconsin and Chicago for our wedding, but ultimately decided that the Peoria connection was too strong to overlook. It was also the perfect way to share our fondness for our hometown and our families. After selecting Peoria, our goals become clear: keep everything calm, simple and personal. Did you plan anything special for your ceremony? The May showers and cloudy skies made for a cozy, warm feeling at First Federated Church, where I have been a member for years. It was important to honor my grandfather, who passed away last June. He was a minister for 25 years and was married to my grandmother for nearly 70 years. My cousin read a passage from First Corinthians, a passage he included in every wedding of his career. We also included two special readings read by close friends and my middle school band director played the trumpet. I also incorporated a piece of lace from my grandmother’s wedding dress in my bouquet. Our siblings were our attendants and my niece and nephew were the flower girl and ring bearer. What Paper Source projects were incorporated into your wedding? 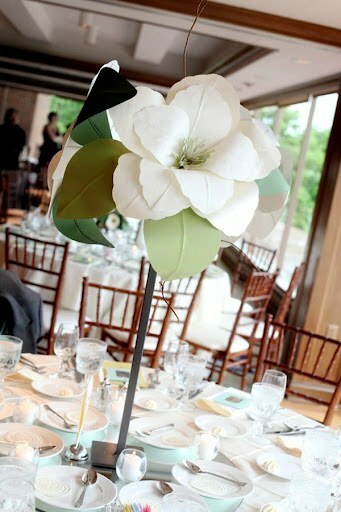 Magnolia paper flowers! 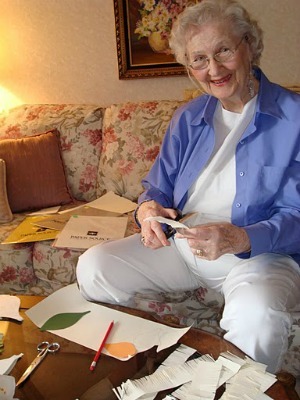 I thought paper flowers were a great way to involve my 93 year-old grandmother in the planning process. Now, she can’t get enough! She cut 2,300 petals. She and my mom made in excess of 30 giant, 100 medium and 100 mini magnolias, each with 10 petals per flower and two leaves per flower! She cut out some of the centers and kept finding ways to do more and more and more. She said creating the paper flowers gave her a purpose. 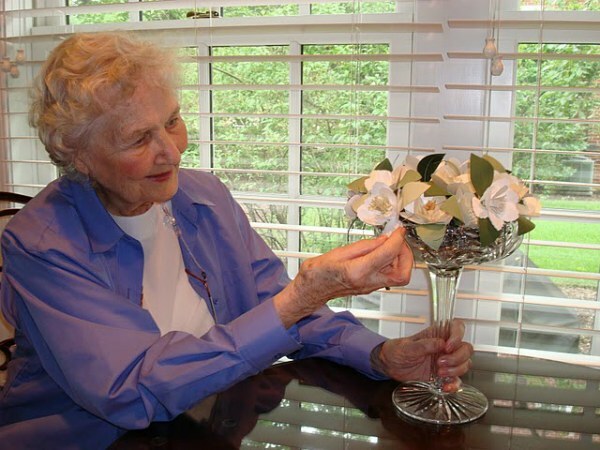 Her favorites were the giant magnolia flowers; she absolutely loves them, as does the entire retirement home where she lives. My mom became quite fond of the mini flowers. 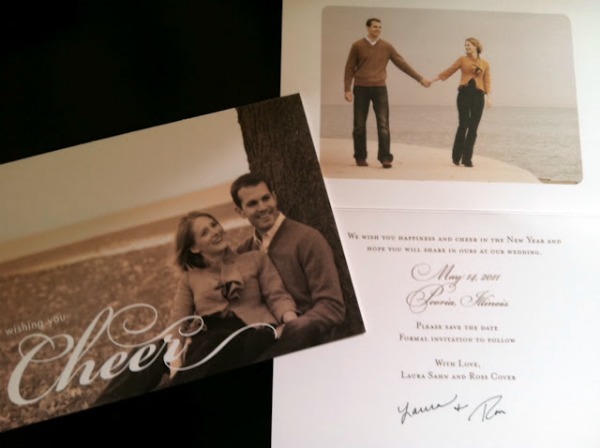 This project gave way to their favorite products: Paper Source paper (especially the shimmer and textured ones) and PVA. Our Save The Date Cards were a holiday photo card design with our favorite photos and our wedding invitations were also from Paper Source. Ross and I designed the ceremony programs using solid paper. We also printed menu cards and used the printable place card and table tent templates found online. Our wedding colors were shades of greens and whites, which Paper Source offered many options. What are the things that made your day unique? We made the paper flowers into reception centerpieces by arranging them in antique cut glass bowls and upside-down cake stands from my mom’s and a family friend’s collections. We included cut branches from a bush in our backyard to make each one unique. That was for the low arrangements of medium and mini magnolias. Each giant magnolia centerpiece was showcased in a metal vessel, created by a blacksmith friend. We purchased steel tubes at a home improvement store and he welded them together. Rather than place cards at tables, we found pictures of each guest from a memorable experience and slipped them into a photo coaster. 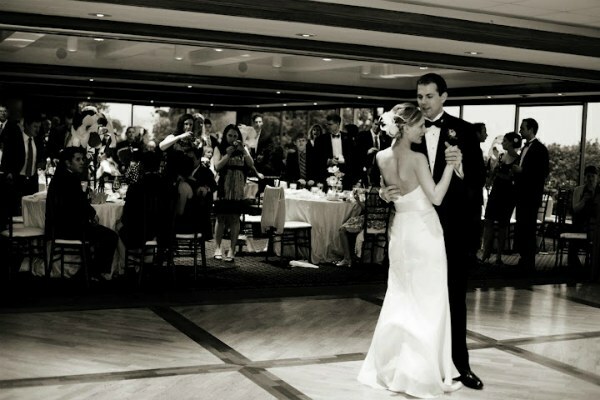 Ross and I had so much fun going through photos and finding the best ones for each guest. Our parents found old photos of their friends as well, many from old yearbooks. They became great conversation pieces. I am gluten intolerant and wanted to treat our guests to a tasty gluten-free meal. 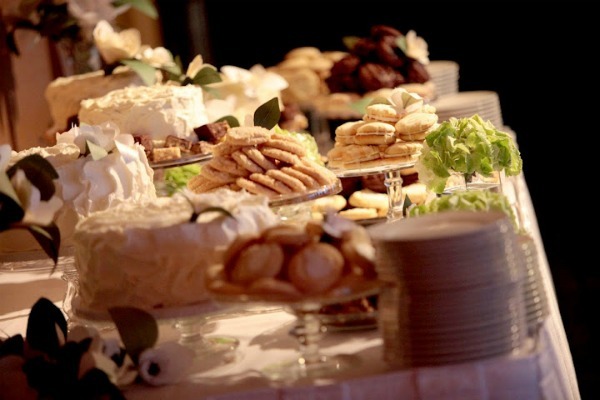 Rather than one wedding cake, we offered a dessert bar full of gluten free cakes, cookies and bar options from a wonderful bakery in Peoria which has a gluten-free kitchen. My brother organized The Run for Cover (Ross’ last name is Cover) the morning of the wedding. This 5K fun run took place on the street where my parents live, which was also the street of our reception venue. Ross and I, along with friends and family, ran through the rain and wind to kick off the big day. Ross and I finished together, and joined guests for breakfast and prizes at my parents’ house before going our separate ways to prepare for the ceremony. Wow, so nice. Thank you for sharing the wonderful stories and pretty photos – it’s clear that a great deal of thoughtful care went into making this day beautiful and very meaningful! Thanks for sharing your special day! I love your center pieces. This is so very thoughtful and lovely!